Two of the four front doors have been blocked up and the pub looks much as it does today except for the signage. Of course, Brickwoods Ales of Portsmouth disappeared when the firm was sold to the much larger Whitbreads. 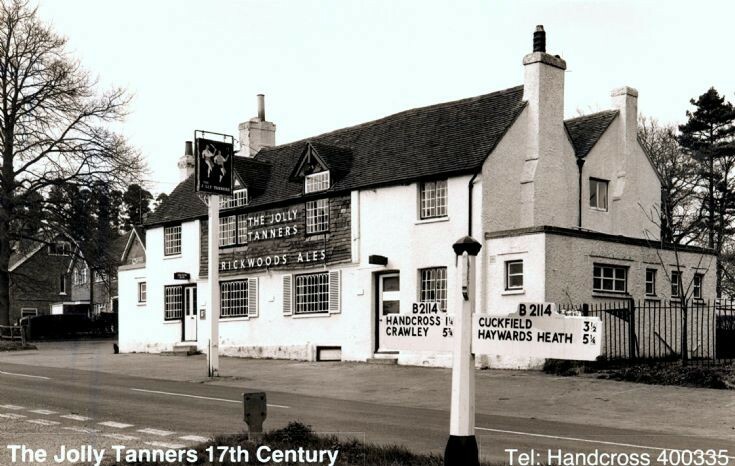 I can still recall the taste of Brickwoods’ infamous Pompey Royal which one had to treat with a great deal of caution. The current finger post shows the B2114 distances as Handcross 1, Pease Pottage 3, and to the south – Slough Green 1, Whitemans Green 3, Cuckfield 4. Methinks, quite an interesting choice of names to put on the signpost. I guess it was inevitable that with the advent of much faster traffic the half and quarter miles would disappear. This photo was taken and used as a postcard when my parents, Bob and Mary White, were landlords from 1964 to 1982. Mary died in 1979 and Bob died in 1982. Hi Madeleine, a lovely picture. I would love to visit there one day. I am doing research on my father's side whose family name is White. Mr great-great-grandfather was William White, born in Chertsey, Surrey, who married Mary Anne Lucas. I think we could be related. I would be grateful if you could give me any information on the Whites.